Christmas was wonderfully quiet, shared with my daughter, my fiancé and the two dogs of course. New Year’s Eve night was spent in solitude, by choice, and I was out as a light just before 2009 was heralded in by party-makers around the world. On New Year’s Day I spent most of the morning into early afternoon doing what is now a three-year practice. My daughter, A, tells me it is a lame way to spend the day but for me it serves a larger purpose. This is a picture of my 2009 collage or vision board. Spending New Year’s Day creating a picture of my goals and intention for the year was accidental. It started at a time when the only way I was going to make it another year was by having something to constantly look at to remind me that life goes on. 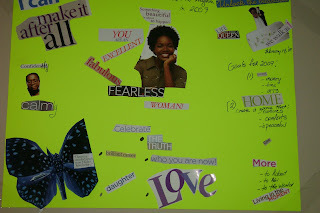 I did vision boards before and knew it was a powerful tool. However, what I have also learned is that without intentional focus the collage is simply a piece of paper with pictures. As such, my two previous collages were placed in spots where it was the first thing I saw in the mornings and the last thing at night. Unlike its predecessors, the 2009 collage is simple in style and content. I was struck by this simplicity as much as I was struck by the fact that my life turned out very much as I visualized in the previous two years. Seeing this, the thought crossed my mind that this year would be smooth sailing. No drama and no grief. Then it came January 20, 2009 and I took the day off to watch every step that Barack Obama took to become the 44th President of the United States of America. I was up at 4:00 a.m., and glued to the television until about 10:00 p.m. (MST) when he and Michelle danced at the 4th official Inauguration Ball. A few days later, I realized how wrong I was that my year would be smooth sailing as I could no longer ignore and had to acknowledge my obsession with the Obamas. It was an uneasy recognition in a very significant way for the rest of my year. At the surface, all is well in my world quite frankly. I have a wonderful career, I am earning a good income, I drive a nice car, we have a beautiful condominium, and my daughter is doing good and getting better with every passing day. My health is in order and so too is that of my first pet Angello. I have a partner, friend and soon-to-be husband who not only love me but he is unafraid to show it and be vulnerable with or stand up to me (LOL). Like Barack Obama with Michelle, he is unafraid of this strong black woman. He tells me no when that is what I need to hear and he tells me yes when that is the right thing to say. And very important to me and to any couple that truly desire to have a long life as a unit - we pray together. “But you are still not living your life fully, Claudette, you have to let go of your pride” was Anni’s response she listened to me share all this with her during a lunchtime telephone conversation. Anni is my best woman-friend and we do not always agree, at least not immediately. This time, however, when she said those words “you have to let go of your pride,” there was no disagreeing. Yes, I am pride-filled and that pride was still smarting from the seeming loss of so many hopes and dreams. That was at the root of my discontent as I watched the Obama’s walking hand in hand down the road to the White House. This might sound sick to some of you but others might fully understand. While I rejoiced with all Americans who felt that a new day had dawned in their country and indeed the world, I felt some regret about my life. As I watched the fulfillment of the Obamas dreams, I could not help but mourn the many dreams I had for my life that were let go or seemingly dashed. Anni was right; I was not fully into the life that was now presented to me. Under the quiet I was still discontented with the trajectory that my professional life had taken, feeling as if I had given up too much and in vain and that my achievements were not as grand as they ought to have been or I had hoped by now at 43 years old. Deep in my heart I was feeling that while on a personal level maybe even romantic level, things could not be better, they would have been prefect if I had not done this or if I had done that. And this feeling left me incapable, until now, to fully embrace my life. As I spoke with Anni I realized that I was still busy looking for my big break, willing to move across the country if necessary, not recognizing that It was already here. With the telephone to my right ear, I closed my eyes as Anni and I prayed, not in the usual way but in a fashion that helped me to really feel what was going on in my body. When I opened my eyes, I slowly looked around my nicely decorated office, peeped through the window and saw the sun ray bouncing off the white snow on top of my car. The light was also flashing on my blackberry and when I checked it was a message from Robert reminding me how much he loves and missed me. Alone in my office, I fell to my knee and asked for forgiveness for the remnant of ingratitude my woman-friend had helped me to uncover. I thanked God for the road that I was walking down, hand in hand with Robert, my baby girl and my friends. In a few weeks, I will be walking down the aisle of this beautiful old church with its piped organs playing in the background and with friends and family from across Canada and Jamaica as witnesses to the next chapter of this life – the one that I was reminded to live fully! posted by Claudette at 3:07 p.m.